Update: Nokia has confirmed that Here Maps will hit Windows 8.1 devices in the Asia-Pacific region following its wide release in Europe and North America, though there's still no specific timeline. Nokia's Here Maps app will soon become available as a free download on every Windows 8.1 device, including tablets, laptops and desktops in both Pro and RT configurations. The Here app for Windows 8.1 has so far been exclusive to Nokia's Lumia 2520, but it will become available as a free download in the Windows Store app marketplace "in the coming days," says a post on Nokia's Here blog. The app will roll out beginning in North America and Europe, presumably continuing in other, undisclosed countries later. 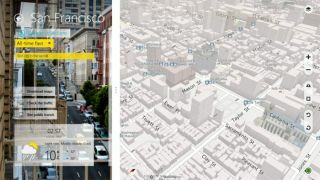 Here Maps is already widely available on Windows Phone 8 smartphones, where it serves the same purpose that Google Maps does on iOS and Android: being the "all-in-one mapping solution," as Nokia puts it. Nokia promises improvements in this newly updated version of the Here Maps app for Windows 8.1. City pages will load as much as four times faster, among other improvements to overall speed, the company said. Being that it's soon to become available for desktop and laptop users, they've also added mouse and keyboard controls. The app's satellite image resolution has been increased as well, making satellite view easier to read even as you zoom in. And Here Maps keeps a record of your searches and routes. We've asked Nokia to clarify where and when the Here Maps app will launch outside the US and Europe, and we'll update this article when we hear back. The gorgeous new Google Maps will soon be available to all.